We are happy to present our latest release in the award-winning iTRAVL series - the ECTACO iTRAVL Deluxe voice activated language communicator that comes equipped with a handy scanner for superior text translation. This unique add-on lets you grab any printed text wherever you find it - in a newspaper, on a theatre program, a doctor's prescription or even from a poster on the wall - scan it, upload it to the iTRAVL instantly, and get a translation into your chosen language right away! - The handheld ECTACO C-Pen portable scanner and translator for prompt text and words translation. - iTRAVL Universal desktop cradle for data exchange with PC, battery charging and ECTACO C-Pen connection. - Hands Free/Eye Free Mobile Infotainment System for language learning in the car, on the train, or on the move. - Linguistic Crossword program - the best in linguistic science - our language learning variation of the world-renowned crossword puzzle. - Smart AudioKeyboard™ program helps you memorize foreign letters, listen to their sound as you type them without the need for a stylus - just use your fingers and select! - Bi-directional, CES Award winning Language Teacher program based on our proprietary speech recognition and speech analysis technology. Perfect for anyone who wants to speak a foreign language with little or no experience, the new iTRAVL understands exactly what you say and provides an instant translation of words and phrases. By simply speaking into the iTRAVL, you can have your phrases translated and spoken aloud using a sophisticated combination of speech recognition modules, real human voice narration and speech synthesis. Featuring a hi-res color touch screen and hands-free speech navigation functionality, it has never been so easy to access the information you need. Other useful features include an Mp3 player, games, calculator, metric converter, and word time clock utilities. 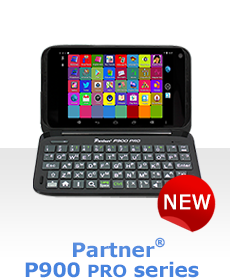 Buy any ECTACO iTRAVL Deluxe Communicator listed below and get the iTRAVL Accessory Pack ( CAD99.95 value) for free! Click here to learn more about regular iTRAVL NTL series language communicators. Click here to learn more about the iTRAVL Innovations Design and Engineering Award 2008 from the Consumer Electronics Association (CES). ECTACO Partner 900 Deluxe series! We are happy to announce a release of the latest ECTACO Partner 900 Deluxe series electronic translators which come with a handheld scanner that allows you to grab any printed text from any surface and have it converted into the target language. These new smart machines feature the most extensive vocabulary with human voicing, the Full Text Translation system with advanced voice output, an easy to use bilingual translating Picture Dictionary, a complete English explanatory dictionary and our latest speech recognition system. These smart new translators contain everything you need for superior translation and accurate communication and even more. Our jetBook e-book reader has also been included as an additional benefit. Exclusive User Dictionaries allow you to store your own personalized lists of frequently used words and a history function remembers your most recent translations to provide instant access to the information you need to understand and be understood. Buy any ECTACO Partner 900 Deluxe series electronic translator listed below and get a P900 Accessory Pack ( CAD99.95 value) for FREE! The Partner 900 Deluxe series models come with the Ectaco/C-Pen handheld scanner, headphones with mic, USB cable, bonus CD, adapter and rechargeable battery included in the standard package. OUR LATEST RELEASE! ECTACO P900 Grand series talking translators! The most recent Partner 900 Grand series models not only come with the scanning pen, but also include the GPS receiver and some useful accessories for your car in the standard package. The GPS attachment clips on to the unit and records its own position, time, date, speed, heading and altitude so you never lose your way. Buy any ECTACO Partner 900 Grand series electronic translator listed below and get a P900 Accessory Pack ( CAD99.95 value) for FREE! The Partner 900 Grand series models come with the Ectaco/C-Pen handheld scanner, GPS receiver, 4GB language card with the US map, car holder, dual USB cable for C-pen, headphones with mic, bonus CD, adapter, rechargeable battery included in the standard package. Please note that the above offers are valid only in conjunction with your online order at www.ectaco.ca and cannot be combined with any other offers! Choose the translation software you need in any of the 48 available languages. Prices range from CAD9.95 to CAD439.95.